The other mats were made of 'kitchen' cotton. This is wool sock yarn, the GGH stuff I was knitting small rabbit toys out of a good while back. I even leashed up a stick to give me a little quicker time of making the single color area. Considering that I began this at 6 pm last night and just picked it back up now today -- this is already pretty far along for the size of yarn. I don't know if this is going to actually work - but my hope is to fashion a woven slipper. The cardboard triangle was made from the back of a notebook. The cardboard is expendable and I made the holes with a long weaving needle. The warp only crosses one side with short loops on the back to hold it down. I've finished one of those 'triangles' to become the side of one slipper and started another. That is probably small enough I could probably take one to work to keep me busy during a lunch break. The long woven piece should end out around 5 by 25 inches, with one end starting at my heel and going down across the sole of the foot, up over the toes and back to the front of the ankle. A few seams at the sides from toes to instep and then sew in the triangle pieces most of the way... Another small woven band with ties would probably be needed to hold it on the ankle. 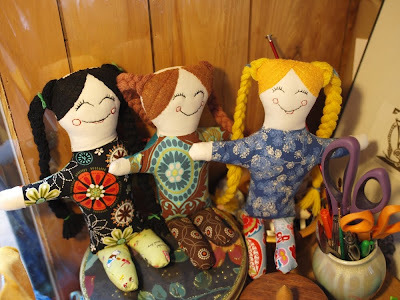 I used to make knit slippers this way back in Fargo -- it was a weird 'I made it up' pattern but it did work with knit. I wonder how it will work with this and if it is even worth a shot? I still work on this stuff once in a while. 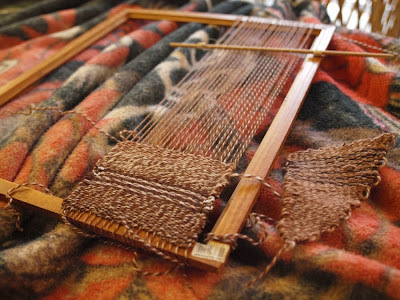 I saw this wonderful blog Backstrap Weaving by LaVerne Waddington the other day - and she inspired me to finish the piece that had been sitting on my loom (ie: picture frame) and start a new one. I think my weavings aren't terribly useful but they are pretty. I put this one under my pillow the other night. Maybe I could make a plainer one for something useful like under Esme's plate - but I tend to make them fancy anyway just to keep myself interested. I haven't kept my woven dream bag under my pillow ever since Esme started pulling everything off the bed while she played. There are beads and a two special pottery tiles and shells in there that I don't want her to get her hands on. Now I carry it in the bottom of my purse. Even her handknit wool dream bag that was under the mattress of her crib is now in a high storage drawer with her Mousebear toy. It has a pottery tile that matches one of mine (the pair were made by a friend of mine on request for Esme's birth) and the small embroidery I made a few days before I went into labor (bridge symbol with quartz beads). All of those are my own personal tokens with 'attachments' of thoughts in my life -- putting good thoughts and hopes and prayers into objects, almost like a letter, except instead of being written prayers they reside in visual/tactile objects. Those are ideas passed to me from my grandmother (Anishinabe and Blackfoot Sioux Indian heritage) and my mom when I was very young. We would go out in the woods and look at plants and herbs and dig in the rocks around the paths near the house and in the stream to find interesting and special things, shells, etc... In my art history and anthropology classes I read that it is a common type of activity in ancient cultures and is passed down between the generations. We went to a church as well - but this didn't have anything to do with religion, more with symbols in time and space, memories etc.... These small art tokens, put away in my keepsake boxes or carried around/worn etc, remind me of things that happened in my own life - important times and especially times of threshold like change and birth and love. An apple ornament. I love this picture, she is so cute! 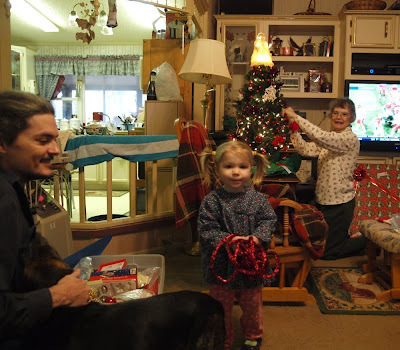 I think Esme had a pretty good idea about Christmas this time around, and she really did enjoy herself. She had such a good time up there this morning I found myself being pulled by the pantsleg back up for another playtime this afternoon. 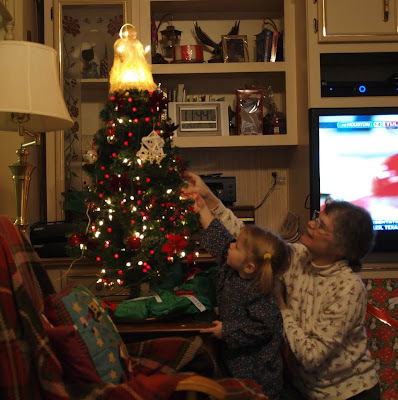 Grandma had decorated a pretty red and gold Christmas tree, and Esme wanted to help her go through the box of 'pretties.' And she understood what presents were and supervised everyone opening them. She did have an interesting 'ooooh!' 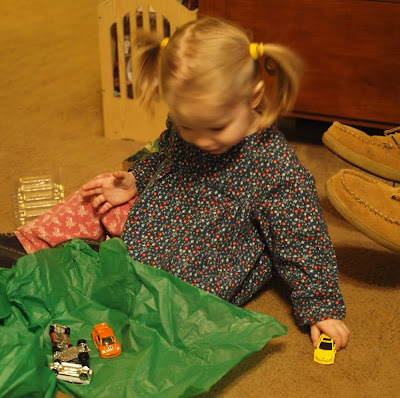 look on her face when she opened the cars and frogs she had seen before. 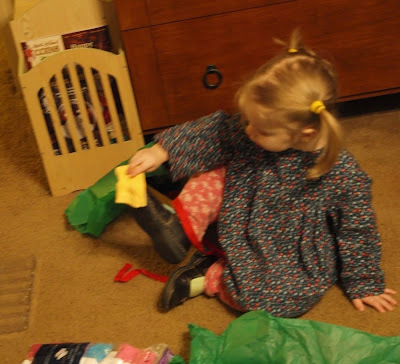 The socks were a happy - and then Grandma gave her a zhu zhu hamster (which she admittedly is a little scared of, but interested) and a table with 2 chairs that she can DRAW on ... (seriously cool in Esme world). Thank you Grandma and Grandpa! p.s. : I almost forgot to mention - Grandma and Grandpa also got us the 'Best of the Electric Company' on DVD. We had been Netflixing it in and Esme had loved it. "Something to watch other than Shaun! ", Mark said. I actually fell asleep last night before Esme (who napped from 5 to 7), she was still up dancing and shouting to the people on the screen when I crashed. Drawing at the table with Daddy! I am happy to say that the pacifier is gone forever - and Esme has slept without it four nights in a row. She did throw a larger fit tonight though about wanting to go out and play more in the wagon after it was dark out and raining. 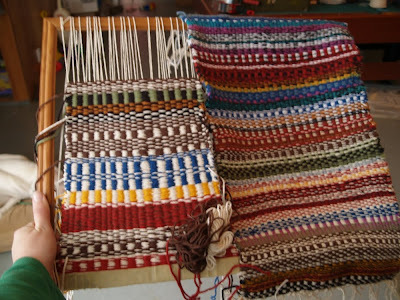 All that after being so good and amusing herself around the room as I put the next weaving on the loom. I put her to bed about 7 and wrapped the presents afterwards while we watched 'Muppet Christmas Carol.' I'll have to post a picture of the latest finished woven mat after Christmas - it's pretty. In truth I've forgotten to get my entire schedule for next week at work! I'll have to come in at 'earliest possible' on Saturday morning ready to work and if the schedule says different either go back home or go have a cup of coffee and read my book a little (depending on how long the wait would be). Maybe I'll be able to find out at 6 a.m. from the manager? We'll see. I really had thought I'd written it down last week so I didn't get the new January one today either! Four days now and if she gets through tonight without a major meltdown I'll count it as gone forever. She has been such a good girl tonight, too. Another cute thing she has been doing lately - we have a white stuffed kitty and a brown stuffed elephant I made. I showed her one day the elephant could 'kiss' with it's trunk. Now she lines the kitty and elephant up in a certain place in the middle of the floor and puts the kitty's nose against the elephant's trunk and says 'Mmmmmmwah!' and makes kissy face. It's terribly terribly cute. Still without it. Last night she woke up at 3 am and cried for about a half hour. It was pitious - but never really intense, just continued whine, putting her hands to her mouth, whine again. She didn't shriek at the top of her lungs like I've heard in the past. I pretended to stay asleep at first, then we asked her if she was 'ok' - told her it should all be 'ok' and reminded her she had her frog (stuffed toy) and her drink cup. I think I fell back asleep before she did. It was quite cute at one moment PeanutNinja the kitten came over to the bed and stretched up there giving her a 'you ok little one? you're crying!' expression. 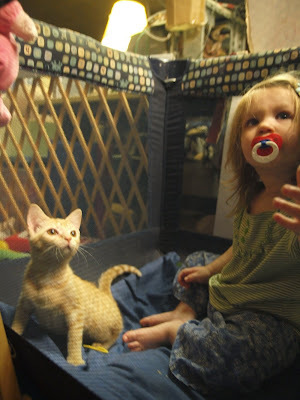 The kitten was ignored, but it was a cute gesture. This morning she gave me some guff after I got her up and dressed. She wanted to go outside and watch the tree trimmers. She hadn't even gotten milk or breakfast yet, so I said 'No, downstairs first - get milk cup and cookie (cereal bar)' She screamed and pitched a fit. I put her back in her bed and said ok I'm going downstairs then... came back up and she was fully ready for milk and cereal bar. Now she's halfway through the bar and the milk and asking again... maybe we will go out and watch the big truck. Mark said she was cute yesterday talking to them. At this moment Esme is using the bottom shelf of my desk here at home as a slide into a large box full of blocks. She was doing it for a while saying 'wheee' but I just now clicked the idea. 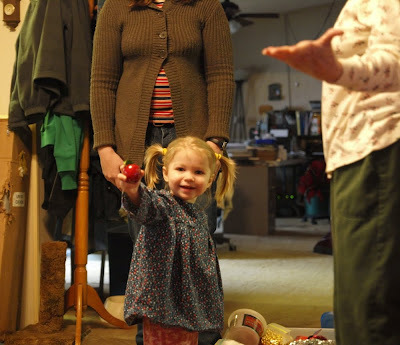 She has been playing loudly with us with her Koosh ball yoyo, and attempting to catch. She hasn't got the idea of grabbing the item but will put her hands out and say 'ready!' and then stand there and let it hit her chest -- and once in a while go into her hands (YAY I DID IT) haha. She was laughing so hard at some points there she could barely breathe. Then when she couldn't catch it a little later there were loud GRRRRRRs and a stomping-on-the-Koosh moment that nearly made Mark fall out of his chair laughing. Slept all night without it - and woke up one hour earlier than usual. She cried and cried for about three minutes, asking for the pacifier once. After she had her breakfast in front of her the tears were gone. I felt a little guilty saying 'you lost it' - but she has made such good progress so far. It's true - she did lose it. I did find it. I just don't want to give it back because she is already, in my mind, too old to have it. And if she sleeps fine and most of the night without it and only cries when she wakes up and can't find it ... that isn't half as bad as last time she lost it and we truly couldn't find it until the middle of the night when she had kept us up screaming for hours. Keeping my fingers crossed that the 'No paci' trend continues. Mark knows where it is if she really gets into a terrible fit later about it. No pacifier all day today. She slept without it last night, and napped without it this afternoon. We did have one giant upset about it after she woke up early from the nap and really wanted it. I took her for a bath instead. So far she hasn't asked for it again but we'll see if she sleeps or stays up crying. I do have to work tomorrow but not until ten a.m. I followed the Buffalo News: Target workers fired over Zhu Zhu pets threads on several sites today. It sounded like hundreds of people wrote emails and letters on the worker's behalf. I'm glad they'll get their jobs back. It was a major overreaction on the side of their corporate rules. To fire seven people at one store during the holidays? In this economy? That doesn't make sense from an ethical point of view OR a corporate business sense point of view. Lose a tenth of your staff at the holidays? No way. Leave seven families in the lurch for employment, in a tough economy, over a plastic hamster? No way. 'this store ran out of my popular toy I wanted' situation. That was the reason for the firing - the employees bought the 'IT' toy this season after they were off work but before the store was officially open. Now, logic says maybe there is something fishy there - but not worthy of firing seven people two weeks after it happened. If seven people did it and it took them two weeks to figure out it was a fireable offense there was some other problem higher in management or rules not being explained properly at fault. One or two newer employees maybe, but not seven employees several of which had been at the company for many years. According to the news article the employees had not 'cleaned out' the stock either - there were more on the shelf when the customers arrived. So.. what was the big deal? Esme lost her pacifier yesterday when I was at work. Mark had let her have it outside the bed for a little while because she's been cranky lately. He thinks she's getting in some new back teeth etc... But she lost it. We asked her where it was and she couldn't find it. I was prepared for a long drawn-out fight to go to sleep like last time. Mark offered to dig through the kitchen and find an old pacifier -- but surprise she complained a little -- Daddy kept saying 'I don't know where it is - you lost it. Do you know where it is?' and eventually she laid down and went to sleep without the screamfest it was last time. It was tucked between the sheets on my side of the bed, about halfway down the length of the bed. Hmm... wonder what that was about? I hid it under a shirt on a high table for now to see if she can live without it. She's been asking for it more and more -- and even made a habit out of asking to go to bed just to chew on it. In other words: haha. She says 'Dooh...(No)' to every yes/no question - even the things she does want / want to do. We have to work on that! I've heard 'I want that - I like that - Pick it up - This a *name of object* - 'Take a bath' - Don't hit - Don't eat (to a cat eating the edge of a box in a movie) and HELP' this week. She always wants help now with the K'nex and her playdough. She has been able to 'say' "fix it" and "hold this" for a while but not clearly enough for anyone but me to really get. I've heard both of those recognizably just within the past week, as well. There were other things too - but she started picking those up not as repeats after I said it but as things she uses herself. I love (sarcasm) that she tells me 'don't hit' when I'm trying to keep her legs down to change a diaper as she is kicking me furiously. I tried to explain to her that kicking was just like hitting with your feet and she was going to tell me 'don't hit' (when I wasn't *growl*) I was going to tell her 'don't kick', because she obviously WAS kicking. She stopped.. but gave me the best 'oh really - tell me another one' look. Some days it's like I'm raising a teenager trapped in a toddler's body. I feel I really should be doing more with my degree - but also that I need to stay in the place I am as there is potential to move up. And Esme is so young right now, I'd like to wait until she goes to school to do anything that will take me away from the house for more of the day than now... but maybe by the time she gets to school age we'll need to look at a better school than what this area can offer? Lots of thoughts going through my head today. I am taking the manager training to move up at the store. Things are going pretty good. But this is the time of year you start to wonder. Can I make more money if I commute to a larger town? I might need to in order to use this training within the 18 month time period it will be good. Am I ready for that? There is a program at the local college that could expand my bachelor of science degree into a teaching degree. It is a two year class, and with the job I have now they will not give me time off or a different schedule to take classes unless I drop to part-time... which would mean less money coming in and more going out. Continue to think on it. I know there is more that I can do than managing a hardware/plumbing department. But I have a hard time jumping into things that might fail when it comes to supporting my loved ones. In other news: Esme begged really hard for a ball-point pen today. 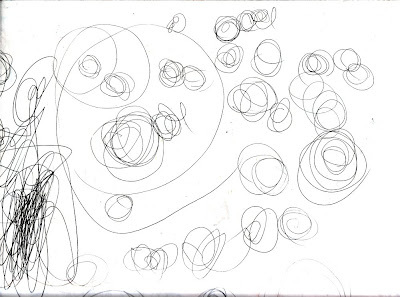 I drew a kitty on the left hand side of the page - which she scribbled all over and underneath - and then did these interesting circles all over the right hand side. Made up a few activities for Esme today that she liked. We have these wooden pegs that came off a tie rack. She likes to count them. 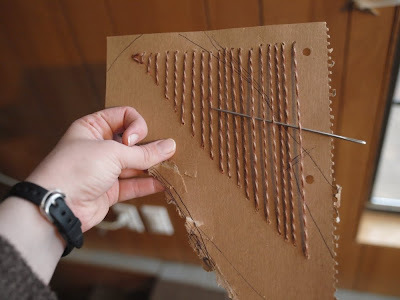 I used a knitting needle to punch a bunch of holes in a piece of cardboard and then we put the pegs in the holes. She directed me where to put some. 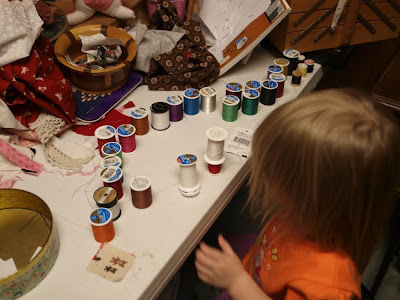 I tried to show her she could loop yarn around them after that but she isn't ready for that part - just the counting and taking out/putting in of the pegs. She found a box of cup hooks upstairs on my shelf. These are leftover from some hardware we used to sell on Ebay. She kept asking me what they were for and insisted on coming downstairs with the box. There is a wire grid basket down there that is supposed to go in the wagon. I turned the basket upside down and started hanging the hooks from the grid. She liked that a lot! I got told where to put several of them again. She took a metal rod and started playing 'bells' on the hooks. She didn't get the idea of putting the hooks on, but was working on fishing them out after knocking them off. It will be fun to work on if she wants to do it again. A description of how to make a top hat out of construction paper. Take a long rectangle as high as you want the hat and long enough to wrap around the wearer's head. Roll it into a tube and tape the sides. Cut a circle for the top a little larger than the diameter of the top of the tube. Slit the outside edge of the circle about 1/4 inch all the way around the circle and fold tabs up. Glue to inside of tube using the tabs. This is the top of the hat. 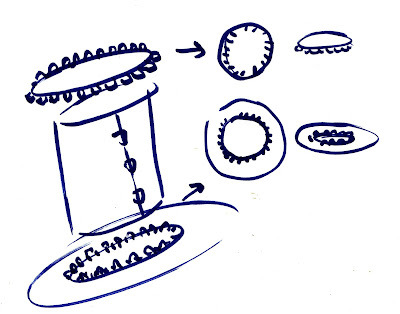 You can make a paper donut to glue to the bottom but it will not be quite as sturdy. If you add some cardboard and a bit of extra work it will be great. Cut a 'brim' cardboard donut that is the proper diameter for the tube on the inside and a bit wider on the outside. Cut a paper donut that is a bit smaller on the inside circle and a bit wider on the outside. Slit the inside of the paper donut just as you did for the top, and bend the tabs up. Slit the outside of the paper donut as well, and bend the tabs in the opposite direction. Glue the cardboard donut to the underneath of the paper donut. Use the outer perimeter tabs to glue over the edge so it is finished. Use the inner tabs to glue to the inside of the tube. That would be a top hat out of cardboard and paper. Perfect for a snowman or Abe Lincoln costume. 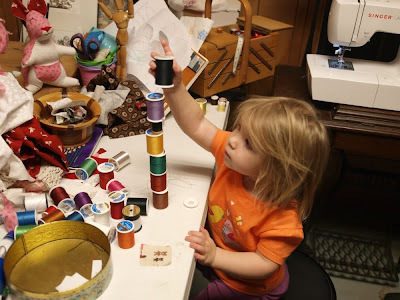 It started like this, after lining up the thread and counting them. each time followed by UH-OH! Haha! 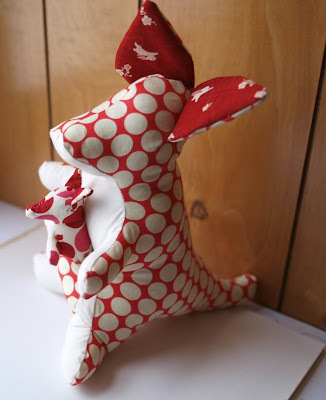 She also did not want to let the new baby kangaroo go at all --- but she did. That sounds like a good review as the set (mama shown in background of these pics) is for a three year old little girl for Christmas. 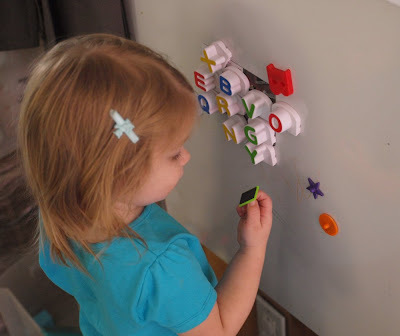 massing magnetic letters on top of a flat advertising magnet... not sure why. 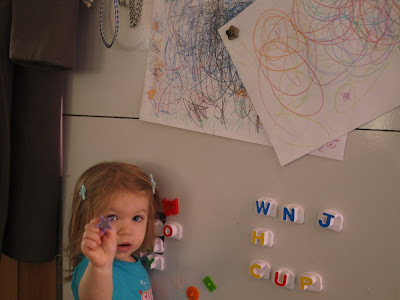 She also got these shape magnets for the first time today - been asking for them for a while. 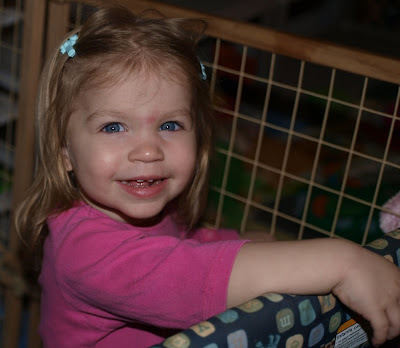 the playpen is the only place she's allowed the pacifier during the day and also at night when she sleeps. It was very rainy today but we had a lot to do - so we went to town. 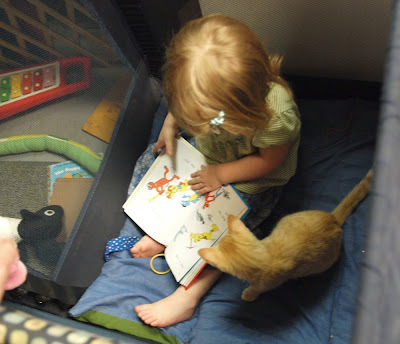 Esme got to see the co-op kitties. they have grown all up and are big fat tomcats. Florence the co-op lady showed her their Christmas tree and gave her a free pamphlet about cows... which Esme loved! All the way around town I kept hearing 'cow, hi cow!' from the back seat. All that talking in the car about cows and she wouldn't say the word for Florence at the co-op at all! At the video store she got a new rubber superball.... she thinks she's entitled to one there now. We got groceries and then went on to the meat market where she also got a pork bbq sandwich and some peanut butter cookies. She loves to eat both so that made her day entirely. We went to Grandma's for just a bit after we got home and then Esme laid down for a nap while Mark and I watched the new Harry Potter movie. 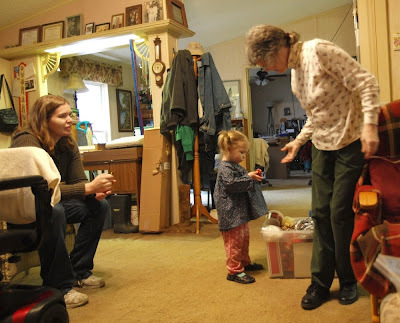 My mom called in the middle of that - Esme woke up, talked to her 'Nana' in Minnesota some. Nana couldn't believe how well she could understand Esme. They talked about shoes and doggies and kitties and a few other things Esme likes to talk about before I enlisted Mark to help in prying the phone out of her fingers and sending her back to bed. I had to explain my last letter to my mom. Hate that. I try to write simple English but she still calls me up to ask what it means. Her memory is fading still and sometimes she can't keep one sentence straight while reading the next etc. She had misunderstood some things I had said and was worried something was wrong with Esme... not sure how she got that. I was telling her the cute story about Esme and the angel doll at the bank she said 'hi girl' to. Mark said it was a good birthday - he rented a few movies he wanted to see, got fresh meat at Trolingers and a few other things. It's the last day of my vacation and ever since the cold hit me in the beginning of the week it's had me down some. I'm not really sick but not well either :( And I'm so tired! Anyway - we did do a lot this week even with all of that in play. 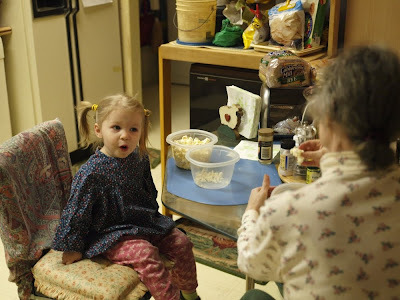 We went to Hazel on Sunday - and then did grocery on Monday and Tuesday (different places have different things) and on Wednesday we went to my work and bought Esme a yellow wagon. It's a 'heavy-duty' outdoors wagon that Mark could even hitch up behind a tractor. Grandpa and Grandma pitched in on it - and it will help Mark a lot this winter when I have the truck and he has Esme and trash or mail to do... she is getting too heavy to carry yet won't walk all the way for him yet. And it is getting colder and there will be snow! I also bought Esme a very cheap plastic elephant. She's loved the elephant on Starfall for so long. I got her two elephant books but she really isn't interested in them -- the plsatic elephant though she told me goes ERRRAR! and put her wrist to her forehead like an elephant trumpeting. He now lives on her teaset table. She also loves the new RAR monster pencil topper more than I could dream for a 50 cent toy. 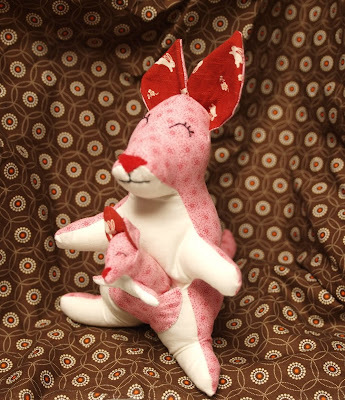 I gave her one of my kangaroos that didn't quite turn out and she can almost say 'garoo' now. At my work she told a lady I worked with she had on the same color sweater as her jacket (pointed at shirt, pointed at jacket and did a 'wow' hand gesture) She also marched right through to the breakroom and over to my locker and grabbed the combo lock - this is what you do, right mom? That amazed a few people. Then she had a tantrum over not getting to keep a candy cane pen. Poor kid! Hopefully I can clean up the house a little before tomorrow comes around... with being so tired and subject to Hurricane Esme it looks really disorganized! 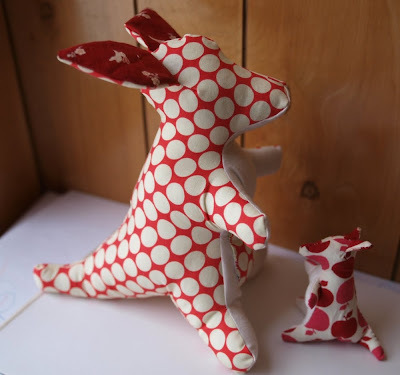 It's been a while since I made a stuffed kangaroo toy and I had lost my original pattern. So - I made this new prototype using similar pieces I had and a picture from the Internet. She turned out pretty good! 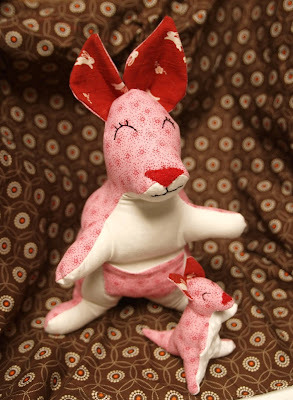 I need to make a pink set now for a Christmas child. This one is going up in the shop!